Chris has another hit on his hands with the Suntech 27. 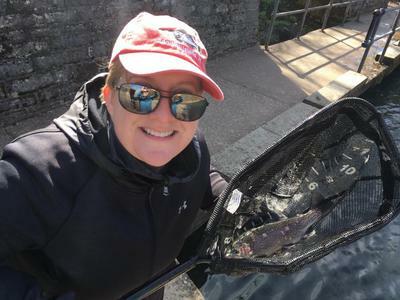 This morning I fished it at Roaring River State Park for the last weekend of the winter catch and release season. It's a great place to test gear because there are lots of trout that have survived the relentless onslaught of the regular catch and keep season, so they're as close to the mythical "educated" fish as you will find in these parts. I rigged up with about 7 ft of Oni 3.5 tenkara line to a tippet ring, 3 ft of 7x tippet, a size 26 micro egg (Senyo laser dub in various colors on a Gamakatsu C12-BM) with a single small clam shot about 8" above the fly. This combo proved absolutely deadly. Suffice to say, the Suntech 27 is capable of handling rainbows to 15-16" IF you can get them out of the fast water quickly enough. 10-12" fish are easily handled even in fast water. I did have several cases of instant break off when large trout took the fly at the very end of the drift. Interestingly, I found that blue was a hot color for the micro egg. I had only tied 2 in that color, guess I'm tying more! Yesterday I started with the Kurenai Long 61 rigged full keiryu style, but due to strong wind I soon gave up on that plan. I switched to my Nissin Fujiryu 410 6:4 and the Fuji furled fluorocarbon line, casting a size 12 purple haze kebari into the banks, basically bass fishing for trout. This tactic got me several fish, much to the amazement of the folks busily tossing their flies into the middle of the stream. I also used the TBum 36 and a size 16 jig style PTN to catch quite a few fish. After she lost several fish yesterday, this morning I really wanted my fiancée to catch some trout so I gave her the TBum 36 and a size 18 UKB. She landed two nice trout, and "long distance C&Red" 4 more. She's still learning how to play a hot fish, but with some coaching I think she's got it now. Can you share how you tied such a small Utah Killer Bugs? Roaring River sounds a lot like several of the parks and popular places in Boise along the Boise River. I am hoping to try a couple of new spots this afternoon when I go fishing. I love the Black Hills. I had an uncle that lived in Rapid City. I don't know if this is your first Black Hills fishing rodeo or not, Jeff, but, if it is, I would suggest googling up "Dakota Angler & Outfitter." Above their banner slide show, you will find a task bar. Slide on over to "Black Hills Fishing," and slip on down to "Black Hills Fishing Guide." This guide was done by SDFG&P, and it will give you a good starting point for finding good fishing waters. A lot of our thin, blue lines are just that--trickles of water with only micros in them. That's a long trip to make to fish for micros. Ha! Enjoy the Hills; June is a great time to be playing in them! Les- I tie them on size 18 Gamakatsu R10Bs. I use only one strand of the yarn. I use thread instead of wire, and if I want them weighted I use an appropriate sized tungsten bead head. I find size 26 on a Gamakatsu C12-BM to be the practical limit of tying with one strand of Spindrift. I have been to the Black Hills twice before with the Scout troop I work with. I've only found time to fish some of the lakes in Custer State Park. The outflow and inflow streams of one of those lakes had trout that I could see, I just didn't have time to fish them. Ive never made it up to Spearfish Canyon, really want to fish that. Thanks for the advice I'll check the website! Jeff, if I had to choose but one creek, and only one creek, in the Hills, I would choose Spearfish Creek. Granted, things have changed since FLW visited the canyon area in 1935, but the scenery is still spectacular and the fish are still willing. You could spend a whole week's vacation fishing this stream and want to come back to do it again and again. Spearfish is another Hills creek that is an excellent urban fishery. So, don't stop fishing when you hit the city limits. There be fish in those citified waters! Also, be sure to fish the skinny waters on Spearfish Creek. There are some nice trout hiding in them that most people walk right past. I would like to add that I was using 7x with the Suntech 27 as I had no 6x at hand. The fish I lost were all due to broken tippet, so I suspect the rod could handle 15-16" fish in fast water better with the maximum recommended 6x tippet. As much as I love my HM30R, I really doubt it could handle those fish in those conditions. The Suntech 27 has much more power in the lower sections than one would expect from such a light rod. Interestingly, most of the tippet breaks occurred at the main line/tippet junction where I was using a stopper knot. On a hunch, I switched to tying a small loop in the end of the 3.5 and tying the tippet to that. After that, I only lost fish that took the fly at the very end of the drift (which was directly downstream from me.) As the fly rose to the surface, fish came up and took the fly and then dove. From a different position, fishing upstream or across, I doubt the instant break off would have occurred. They happened so fast I didn't even have time to flip the rod over to my side to allow some flex in the system.